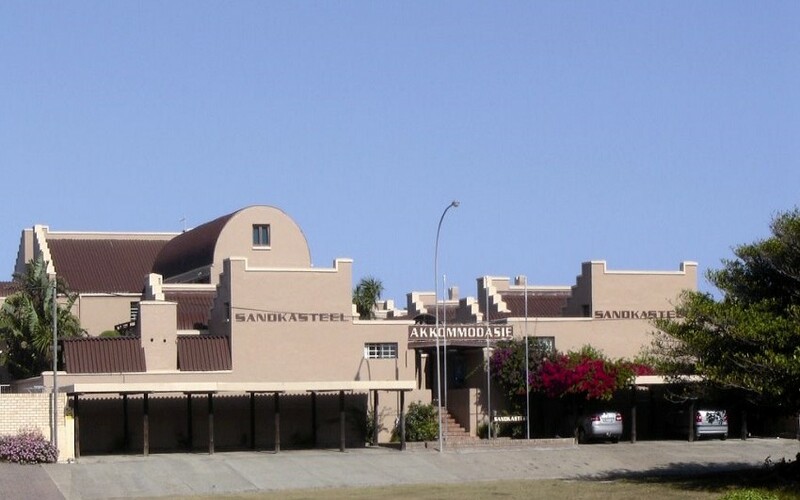 Situated 30m from Dolphin Beach and close to the world famous Supertubes surfing break, you will find the Mediterranean styled holiday resort, Sandkasteel. Sandkasteel is a self-catering complex with 2 and 3 bedroom units, sleeping two to six people. Each unit is fully furnished and equipped - with private braai (BBQ) areas and colour television with M-Net. Washing can be arranged at request. Come and enjoy everything that your hearts desire - fishing, surfing, swimming and shell collecting or just some strolling along the sandy shore. Suites 2, 3 and 4. Each unit is fully furnished and equipped - with private braai (BBQ) areas and colour television with M-Net. Suite 2 contains 2 bedrooms, both with 2 Twin beds. Suites 3 and 4 contain two bedrooms. The main bedrooms in each have a double bed, whilst the second bedrooms in each contain 2 twin beds. This suite contains 2 bedrooms, both with 2 Twin beds. This suite consist of two bedrooms. The main bedroom has a double bed, whilst the second bedroom contains 2 twin beds. This suite consists of two bedrooms. The main bedroom has a double bed, whilst the second bedroom contains 2 twin beds. Suite 5. This spacious suite is a 2 bedroom unit, with 4 beds in the loft. The main bedroom contains a double bed, whilst the second bedroom consists of 4 twin beds. It has a large family room with an open plan kitchen. This leads onto the patio overlooking the ocean. This spacious suite is a 2 bedroom unit, with an upstairs loft. The main bedroom contains a double bed, whilst the second bedroom consists of 2 twin beds. It has a large family room with an open plan kitchen. This leads onto the patio overlooking the ocean. Suite 7. This suite is a one bedroom unit, which contains a double bed. This suite is a one bedroom unit, which contains a double bed.